In the Middle Ages, up to the nineteenth century, Afghanistan was part of a larger region known as Greater Khorasan. 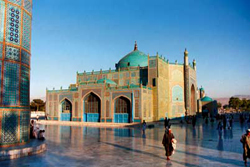 Several important centers of Khorāsān are thus located in modern Afghanistan, such as Balkh, Herat, Ghazni and Kabul. It was during this period of time when Islam was introduced and spread in the area. The region of Afghanistan became the center of various important empires, including that of the Shahis, Samanids (875–999), Ghaznavids (977–1187), Seljukids (1037–1194), Ghurids (1149–1212), Mongol Empire, Ilkhanate (1225–1335), and Timurids (1370–1506). Among them, the periods of the Ghaznavids and Timurids are considered as some of the most brilliant eras of the region's history. Their rule continued with the Ilkhanate (one of four Subordinate Mongolian Khanates), and was extended further following the invasion of Timur Lang ("Tamerlane"), a ruler from Central Asia. In 1504, Babur, a descendant of both Timur Lang and Genghis Khan, established the Mughal Empire with its capital at Kabul. By the early 1700s, Afghanistan was controlled by several ruling groups: Uzbeks to the north, Safavids to the west and the remaining larger area by the Mughals or self-ruled by local tribes. In 1738, Nadir Shah and his army, which included Ahmad Khan and four thousand of his Pashtun soldiers of the Abdali tribe, conquered the region of Kandahar from the Hotak Ghilzais; in the same year he occupied Ghazni, Kabul and Lahore. On June 19, 1747, Nadir Shah was assassinated by the Persians and Ahmad Shah Abdali called for a loya jirga ("grand assembly") to select a leader among his people. The Afghans gathered near Kandahar in October 1747 and chose him as their new head of state. Ahmad Shah Durrani is often regarded as the founder of modern Afghanistan. After the inauguration, Ahmad Shah adopted the title padshah durr-i dawran ('King, "pearl of the age") and the Abdali tribe became known as the Durrani tribe there after. By 1751, Ahmad Shah Durrani and his Afghan army conquered the entire present-day Afghanistan, Pakistan, Khorasan and Kohistan provinces of Iran, along with Delhi in India. He defeated the Sikhs of the Maratha Empire in the Punjab region nine times, one of the biggest battles was the 1761 Battle of Panipat. In October 1772, Ahmad Shah retired to his home in Kandahar where he died peacefully and was buried there at a site that is now adjacent to the Mosque of the Cloak of the Prophet Mohammed. He was succeeded by his son, Timur Shah Durrani, who transferred the capital of their Afghan Empire from Kandahar to Kabul. Timur died in 1793 and was finally succeeded by his son Zaman Shah Durrani. Zaman Shah and his brothers had a weak hold on the legacy left to them by their famous ancestor. They sorted out their differences through a "round robin of expulsions, blindings and executions", which resulted in the deterioration of the Afghan hold over far-flung territories, such as Attock and Kashmir. Durrani's other grandson, Shuja Shah Durrani, fled the wrath of his brother and sought refuge with the Sikhs. Not only had Durrani invaded the Punjab region many times, but had destroyed the holiest shrine of the Sikhs - the Harmandir Sahib in Amritsar, defiling its sarowar with the blood of cows. The Sikhs, under Ranjit Singh, rebelled in 1809 and eventually wrest a large part of the Kingdom of Kabul (present day Pakistan, but not including Sindh) from the Afghans. Hari Singh Nalwa, the Commander-in-Chief of the Sikh Empire along its Afghan frontier, invaded the Afghan territory as far as the city of Jalalabad. In 1837, the Afghan Army descended through the Khyber Pass on Sikh forces at Jamrud. Hari Singh Nalwa's forces held off the Afghan offensive for over a week — the time it took reinforcements to reach Jamrud from Lahore. One day before the September 11 attacks in 2001, on September 10, the George W. Bush administration agreed on a plan to oust the Taliban regime in Afghanistan by force if it refused to hand over Al-Qaeda leader Osama bin Laden. Many noted that of the 19 men who hijacked planes on September 11, none were Afghans (fifteen of the hijackers were from Saudi Arabia, two from the United Arab Emirates, one from Egypt, and one from Lebanon). None lived in Afghanistan (they lived in Hamburg). None trained in Afghanistan (they trained in Florida). None went to flight school in Afghanistan (that training occurred in Minnesota). In October 2001, following the September 11 attacks the United States launched Operation Enduring Freedom, a military campaign to destroy the Al-Qaeda terrorist training camps inside Afghanistan. The U.S. military also threatened to overthrow the Taliban government for refusing to hand over Osama bin Laden and several Al-Qaeda members. The U.S. made a common cause with the former Afghan Mujahideen to achieve its ends, including the Northern Alliance, a militia still recognized by the United Nations as the Afghan government. 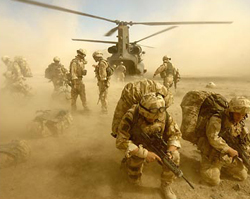 The United Nations Security Council (UNSC) did not authorize the U.S.-led military campaign in Afghanistan. The United States sent teams of CIA paramilitary officers from their Special Activities Division and U.S. Army Special Forces to invade Afghanistan to aid anti-Taliban militias, backed by U.S. air strikes against Taliban and Al-Qaeda targets, culminating in the seizure of Kabul by the Northern Alliance and the overthrow of the Taliban, with many local warlords switching allegiance from the Taliban to the Northern Alliance. In December 2001, leaders of the former Afghan mujahideen and diaspora met in Germany, and arrived at the Bonn Agreement for the formulation of a new democratic government that resulted in the inauguration of Hamid Karzai, an ethnic Pashtun of the Durrani clan (from which the royal family was drawn) from the southern city of Kandahar, as Chairman of the Afghan Interim Authority. After a nationwide Loya Jirga (Council of Elders) in 2002, Karzai was chosen by the representatives to assume the title as Interim President of Afghanistan. The country convened a Constitutional Loya Jirga in 2003 and a new constitution was ratified in January 2004. An election was held in October 2004, and Hamid Karzai was elected President of the Islamic Republic of Afghanistan. Legislative elections were held in September 2005. The National Assembly – the first freely elected legislature in Afghanistan since 1973 – sat in December 2005, and was noteworthy for the inclusion of women as voters, candidates, and elected members. As the country continues to rebuild and recover, it is still struggling against poverty, poor infrastructure, large concentration of land mines and other unexploded ordnance, as well as a huge illegal poppy cultivation and opium trade. Afghanistan also remains subject to occasionally violent political jockeying. The country continues to grapple with the Taliban insurgency and the threat of attacks from a few remaining elements of Al-Qaeda. At the start of 2007, reports of the Taliban's increasing presence in Afghanistan led the U.S. to consider longer tours of duty and even an increase in troop numbers. According to a report filed by Robert Burns of Associated Press on January 16, 2007, "U.S. military officials cited new evidence that the Pakistani military, which has long-standing ties to the Taliban movement, has turned a blind eye to the incursions." Also, "The number of insurgent attacks is up 300 percent since September 2006, when the Pakistani government put into effect a peace arrangement with tribal leaders in the north Waziristan area, along Afghanistan's eastern border", a U.S. military intelligence officer told reporters. By the end of 2008, the Taliban had severed any remaining ties with al-Qaeda. According to senior U.S. military intelligence officials, there are fewer than 100 members of Al-Qaeda remaining in Afghanistan. In early November, U.S. Ambassador to Afghanistan Karl W. Eikenberry, a retired three-star general who in 2006-2007 commanded U.S. troops in Afghanistan, repeatedly cautioned that deploying sizable American reinforcements would result in "astronomical costs" — tens of billions of dollars — and would only deepen the dependence of the Afghan government on the United States. On November 6, 2009, he wrote Secretary of State Hillary Clinton, "Sending additional forces will delay the day when Afghans will take over, and make it difficult, if not impossible, to bring our people home on a reasonable timetable. An increased U.S. and foreign role in security and governance will increase Afghan dependence, at least in the short-term." On December 1, 2009, U.S. President Barack Obama announced that he would escalate U.S. military involvement by deploying an additional 30,000 soldiers over a period of six months. He also proposed to begin troop withdrawals 18 months from that date. The following day, the American commander in Afghanistan, Gen. Stanley A. McChrystal, cautioned that the timeline was flexible and "is not an absolute" and Defense Secretary Robert Gates, when asked by a member of the Senate Armed Services Committee if it is possible that no soldiers would be withdrawn in July 2011, responded, "The president, as commander in chief, always has the option to adjust his decisions." On December 7, Afghan President Karzai said it may be five years before his army is ready to take on the insurgents and that Afghanistan's security forces will need U.S. support for another 15 to 20 years. The Taliban can sustain itself indefinitely, according to the top U.S. intelligence officer in Afghanistan. He wrote, "The Taliban retains [the] required partnerships to sustain support, fuel legitimacy and bolster capacity." His assessment was that the Taliban's "organizational capabilities and operational reach are qualitatively and geographically expanding" and the group is capable of much greater frequency of attacks and varied locations of attacks. In January, 2010, American officials said privately that the Pakistanis are reluctant to go after the Afghan Taliban and the Haqqani network because they see them as a future proxy against Indian interests in Afghanistan when the Americans leave. On January 26, 2010, at a major conference in London conference which brought together some 70 countries and organizations, Afghan President Hamid Karzai told world leaders that he intends to reach out to the top echelons of the Taliban within a few weeks with a peace initiative. Karzai set the framework for dialogue with Taliban leaders when he called on the group's leadership to take part in a "loya jirga" -- or large assembly of elders—to initiate peace talks. Karzai also asked for creation of a new peacemaking organization, to be called the National Council for Peace, Reconciliation and Reintegration. It remains unclear whether the insurgents, who have spread to 33 of Afghanistan's 34 provinces, are ready to negotiate, or would prefer to simply await the departure of western troops. A Taliban spokesman declined to talk in detail about Karzai's plans and only said the militants would make a decision "soon" about his offer. Karzai's top adviser on the reconciliation process with the insurgents said that the country must learn to forgive the Taliban.